Jeni over at mostlymommyhood.com admires our banquette from the Midtown Ventura Remodel post. Well, we'll be happy to build one. Those windows look a little low in the space she shows on the site. I wonder if we can notch around them. This midtown Ventura remodel must be seen to be believed. This family poured their heart and soul (not to mention plenty of hard work) to transform their kitchen from a small crowded room into a wide-open family space. I was pleased to be a part of their design process and, since I live nearby, I have been able to keep tabs on their progress. It has been a few months since we installed our cabinets, so I went over this morning to see the final result and take a few photos. Needless to say, I was very pleased with the results. They did a great job putting the kitchen together, choosing lighting and fixtures, wall, cabinet, floor, and countertop colors. We love it when customers send in photos of the finished work. It's not often we get to see the whole thing completed with counters and fixtures, so it's great to see it when a customer sends us a photo. What we really want is our customers to get the bathrooms and kitchens they want and need, and so a picture usually means they did and they're excited to share it with us. 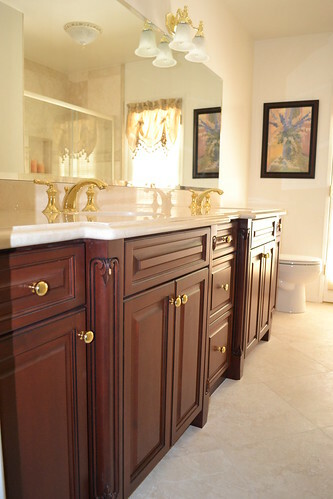 This bathroom remodel in Camarillo ended up being quite lovely. Maple cabinets, Eagle doors, Chestnut finish with a black glaze, with legs at the sinks that were "popped out" proud of the cabinets. Rubottom Cabinets is a Ventura, CA business. We love our community. This gorgeous video by Jim Martin of jmshots.com gives a good sense of our town.